‘Dedicated memory’ is the phrase that came to mind when I was speaking with Suresh Kimtee – a 63 year-old Marwari residing in Hyderabad. His family name ‘Kimtee’ is bestowed by none other than the hero of Mewar, Maharana Pratap. In a calm and unwavering tone, he narrates the incidents, like a seasoned storyteller, painting the words with rich text and subtext. It is the memory of this history that shapes his entire being and affirms his very existence. He is described by his family and friends as calm and serene, knowledgeable in every field, dependable, and above all, passionate about cooking. Sisters and nieces wait for their jars of pickles every summer, which he prepares with his own hands. Namaste Sureshji. First of all, tell me about the intrigue that surrounds your family name. That would take me back to my ancestors. We, the Kimtees, can trace our family history back to 17 generations, right up to Lalsinghji Dhupia, the father of Gangaramji. In the famous battle of Haldighati in 1576, between the Rajputs and the Mughals, Gangaramji and his family pledged their allegiance to Maharana Pratap and fought the battle. Most of the male adults lost their lives in the battle while the children and women escaped to the forests. Touched by the devotion and sacrifice of the family, Maharana Pratap himself is said to have stated, “Yeh ek kimtee tyaag hai,” which translates as, “This is a rich sacrifice.” The king then bestowed the title of ‘Kimtee’ upon the family and the family adopted the title as their surname. What an awe-inspiring episode! No wonder you have a dedicated memory. Yes, I feel humbled to belong to this lineage. Whatever I have heard and seen of my ancestors has truly made its imprint upon me. I will be delighted if you can tell us about the astrological prediction about your family fortune. My great-grandfather, Pannalalji Kimtee migrated from Chittor to Rampura, a village near Chambal in Madhya Pradesh, where he led a humble existence with his family. One morning, he met an astrologer who told him that he must leave that place immediately if he wanted to find his fortune. He also told him that if he left that very minute without looking back, one of his descendants would become a multi-millionaire. And he believed the man? Yes, he instantly got up and, in the very same clothes, started walking towards the South. He asked a villager to inform his family. It took him six months to reach Bombay (now Mumbai). There, he worked for a jeweller and learnt to evaluate gemstones. After four years, he left for Hyderabad. As he did not find a good job there, he joined the Nizami state. Mehboob Ali Pasha, the sixth Nizam, was impressed with his valuation of gems and made him the chief valuation agent. He spent the rest of his life here. His younger son, Ramlalji adopted a son in 1973 whose name was Sampatlalji – my father. I have heard much about Sampatlalji Kimtee and his rise to fame and success. My father was well-read and held a degree in law, but he was not a practising lawyer. He started his career with a job in an import-export unit in Hyderabad. His performance was exemplary and after some years, he started on his own in the share market. Unfortunately, he incurred huge losses and brought ill-fame to the family by his borrowings. After a few years of struggle, my father’s luck turned. He took Taj Glassworks Private Limited on a lease for five years, appointed 800 workers, and rose to success. The ruling government asked him to surrender the company. He refused and that led to trouble. The labour union rebelled at the same time and the unit was shut down. A law suit was slapped on him. His education held him in good stead at this point and he fought his own case. The trial went on for six months as many senior officials were involved. Finally, he won the case. After that, there was no looking back. He bought land and started the pawn-broking business. Later, he started a dairy farm and also a dal mill. How did this turn of luck change his life; for instance, his social standing? Apart from the comfort that wealth can bring, my father also gained a lot of social respect. He formed marriage alliances for his children with the finest families in our community. It was truly a case of rags to riches, but the one good thing it did was taught us to pitch in for the housework. Even though most men in my community do not get involved in housework, I grew up learning that one should not be ashamed to do any kind of work. I used to see my mother managing so much of work all the time that I simply started helping her. I also liked being around her more than going out and playing. Her cooking was simple, yet special, and I wanted to learn whatever she prepared. So you have been cooking since your younger years? In the beginning, I was simply helping my mother. It was around 1999 that my wife Thara fell unwell and the doctors asked her to rest completely. So, gradually, I started spending more time in the kitchen. For the past 10 years, I have been cooking almost every day. My mother was a disciplinarian. She was quite strict with all her six daughters and six daughters-in-law. We had a conservative upbringing and were expected to adhere to the family rules. I don’t ever remember sitting in front of my father. We would stand before him in a subservient manner and answer his questions in monosyllables. Our house functioned like military rule. Yet, a much-loved place for the large extended family…. Oh yes, hospitality was the first rule [laughs]. Holidays were fun times when my cousins, aunts, nephews and nieces came for the summer stay. All these memories are part of an old-world charm. Along with the summer pickles? Yes, I always assisted my mother in picklemaking. When the mango season would be in full swing, we would buy sacks of 2,000 mangoes at a time. A ritual that has continued ,no doubt. I have heard much about your pickle making and pickle distribution. Yes, more than 40 jars are sent out every year. We enjoy interacting with our large extended family and love having family and friends over at our place. Maintaining good relationships is an important aspect of our life. Indeed, your niece describes both of you as an extremely hospitable and dependable couple. Tell me, what is the secret to good cooking? Cooking is no big deal; all it needs is passion and dedication – dil se banao. I think my passion for cooking intensified at Gokul Chaat, the finest chaat shop in Hyderabad. I would spend hours watching how they prepared the delicacies and absorbed their meticulous attention to detail. Every step is important in cooking. Right from choosing the vegetables to chopping them to perfect sizes, to cooking with patience. 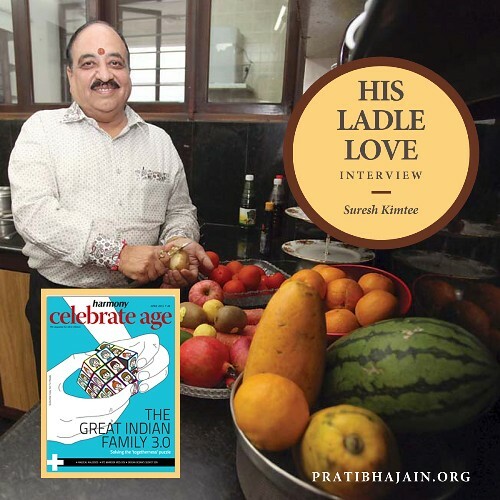 First published in April 2015 in Harmony – the Indian magazine for silvers for the column – ‘His Ladle Love’. A series about men who experience the joy of cooking and can weild a deft ladle in the kitchen. Part-2 of this post is the recipe of Sambhariya, a signature sabzi with small potatoes and onions.